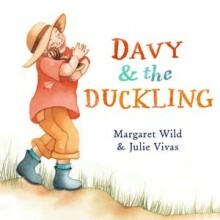 Davy and the Duckling is a children's picture book, written by Margaret Wild, illustrated by Julie Vivas and published by Penguin/Viking (2013). When the baby duck hatched, the first thing it saw was Davy. It fluffed its feathers – and started following Davy everywhere. Around the farmyard, under the apple trees and all the way home. From picture-book masters Margaret Wild and Julie Vivas comes this gentle and moving story about the love between a little boy and the duckling that stays with him all of its life. We can't blame publishers for putting a positive spin on their books. But I truly believe "picture-book masters" is accurate where Wild and Vivas are concerned. Davy and the Duckling is a testament to their mastery. Right from the title and the front cover, where we see Davy snuggling the duckling to his neck, right from the end papers with their lovely ducky feathers, right from the simple yet evocative text, we're aware that here is a very special picture book destined to become an Australian classic. Wild has chosen the theme of friendship, and brings us a story that will broaden our concept of "friends." The duck is as important to Davy as Davy is to the duck. Children who have pets will certainly understand that bond, and will also begin to appreciate the cyclic nature of life when Davy's own daughter makes friends with the duck. Vivas's watercolours are soft but rich with delicate colour. Textural detail will have stubby little fingers reaching out to gently stroke straw, grass and feathers. Her style is beautifully expressive, and there are lots of details for children to discuss and think about. There are also excellent Teacher Notes from Erin Wamala to help extend the literature experience.